A council of Tribal droids await to deliver Tribal punishment to any who fall before the court. A list of long outdated and archaic punishments await any mouse thrown to its mercy. The Tribal Law Trap Skin can be used on the Judge Droid Trap. The weapon's stats (power, power bonus, attraction bonus, etc.) are not changed. 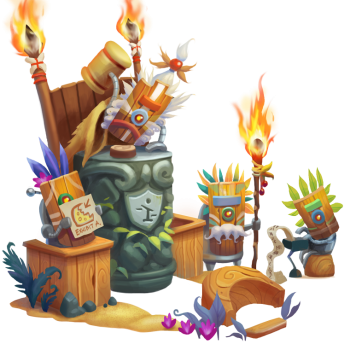 The Tribal Law Trap Skin may be made available at Ronza's Traveling Shoppe and can be traded on the Marketplace or through Give To Friends. 24 July 2018: The Tribal Law Trap Skin was introduced during Ronza's 2018 visit. This page was last edited on 27 July 2018, at 06:14.